A Noggin' Full Of Noodles: Is The Economic Crisis Good For America? First off I want to apologize for not posting the last 2 weeks. Believe it or not, I've been doing A LOT of thinking and writing (in note form), but have not had time to really sit down and hammer out my thoughts in an a more reader friendly format. Don't worry, I have much on mind that I hope I catch up on here soon. Interestingly enough, a lot of the thoughts I have are all converging. Once I am ready to tackle these thoughts, new ideas and/or circumstances cause me to take a step back and ponder more! The center of a lot of my thinking of late centers around the global issues that plague our world. With issues like global poverty, hunger, war, social justice, oppression, slavery, etc... always near the front of my mind, I have found myself thinking less about what we/I can do (even though that is always a big concern for me) and more about what causes and perpetuates these problems. This has a lot to do with our Bible Study Community reading and discussing Brian McLaren's Everything Must Change. In this book he tackles the systems that keep us from solving these global problems. More on that in another post. 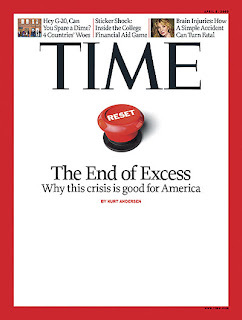 Magazine with the cover story, "The End of Excess: Why This Crisis is Good For America" (click on link to read the full article). There are some interesting things pointed out. We saw what was happening for years, for decades, but we ignored it or shrugged it off, preferring to imagine that we weren't really headed over the falls.....Even smart, proudly rational people engaged in magical thinking, acting as if the new power of the Internet and its New Economy would miraculously make everything copacetic again. We all clapped our hands and believed in fairies. • Admit that we are powerless over addiction to easy money and cheap fossil fuel and living large — that our lives had become unmanageable. • Believe that we can, individually and collectively, restore ourselves to sanity and normal living. • Make a searching and fearless moral inventory of ourselves and be entirely ready to remove our defects of character. Unfortunately, those steps are only a start, but the article shines with hope...at least for some people. Others (the addicts that are in denial or want to remain addicted to our "prosperity, security, and equity systems" (EMC)) will find this a judgement of damnation in their lives. For me, although this economic crisis hurts, (I like my comfortable consumerist life), I see a hope that this is the breaking down of those addictive systems. I hope that this helps break us out of our collective greed bubble and will help us focus on the role we, as the wealthiest nation in the world, can play in solving these global crises. We've already seen it. When gas prices get too high we start looking into more affordable vehicles and learn about our carbon footprint and begin to focus on the environment. However, as gas prices dropped, we once again looked longingly at the newest H2. No, our addictions are much deeper and a bigger intervention is required. Perhaps an economic meltdown is the kind of intervention we need! Trust me... it hurts me to say that. It also scares the living snot out of me! However, we can do it...."Yes we can!" We can break free of our suicidal systems and addictive habits and begin to see past ourselves into a bigger world; a world where there are a LOT of issues that we need to deal with. Its not just about helping others, its about helping ourselves. Its about working for the good of the collective, not just working for our own good. These are American issues. By that I mean these are issues about which Americans should be concerned. By ignoring these issues and denying "the American dream" ideal to the world, we have lost our own identity as a great country! These are also spiritual issues! While we've been in our own secure little bubble where our biggest concern is safeguarding ourselves at the expense of others, we've been losing our very soul! We would sell the very essence of who we are...who we are created to be. All for excess. How? Because we are all connected. we are connected to the abused, malnourished, mistreated, and alienated human-beings that we've all been ignoring for far too long. We are all created in the image of God...referred to as the children of God. Yet we've been ignoring our own siblings. This is why I see hope in this article. Don't question my patriotism, I love America! But perhaps this is the kick in the pants we all need to see past ourselves and to begin living for something other than ourselves...something BIGGER than ourselves! I'm working on a project where I am bringing clean drinking water to a community in remote Northern Kenya. (Shameless plug: Dynamic Water) Through this, I was invited to come speak in a Public Policy class at Duke this past Monday. I believe the answer to that question is a resounding yes. That's why I am working on bringing these people clean water. Thanks for the reply and thoughts. And no shame in the plug. As a matter of fact, when our discussion group finishes this book (EMC) we are going to spend some time looking at different outlets and opportunities; what people are doing to make a more global impact. So I'll look more at this and prob. plug it for you in our group! I want to give as many options as possible. Thanks for the catch on that line, I'm quite fond of that statement myself. Not because it is profound or anything like that, but because I feel passionately about it. I think it is a "resounding yes"! I think it always has been, and although you and I feel that way, I am hoping that others are starting to see this too through our crisis. I think that this is the time to be "evangelizing" (if I can hijack that word for my own meaning) to others the importance and responsibility we have to those not pulling the "American lottery" (Nice line btw). I encourage and support your work my friend. I celebrate what you are doing, and hope that you have many more opportunities to talk about "Dynamic Water" and these issues in general. I hope that others read your comment and click the link! We could get together for some lunch sometime. My schedule is pretty flexible. Let me know if you want to set something up.